Here you can register for upcoming events, request special orders, or reserve a table for any occasion! Your name and phone number will be publicly displayed on our event calendar. Just let us know if you’d like that omitted. How often would you like to repeat this event? Reservations are not guaranteed until confirmed. We require min. 48hrs notice! General Area: All Ages. No fee for table use. Reservations are limited to 8-12 people as space allows. The Big Dungeon Room: All Ages*. $5/hr or $25/day. 8 people max. *Bar service available if no minors present. The Small Dungeon Room: All Ages*. $2/hr or $10/day. 4 people max. *Bar service available if no minors present. Foyer: All Ages. $4/hr or $20/day. 8 people max. The Critical Sip: 21+ Only with valid ID. No fee for table use. Reservations are limited to 8-12 people as space allows. The Level Up-Extra Life Room: 21+ Only. $10/hr or $50/day. 20 people max. The Level Up-Home Screen: 21+ Only. $10/hr or $50/day. 40 people max. ALCOHOL POLICY: There is alcohol service in the Critical Sip, the Home Screen, and the Extra Life. Alcohol service is also available in the Dungeon Rooms if everyone present is 21+ with valid ID. In accordance with our OLCC limited license, no beverages and beverage containers from outside the store are allowed wherever alcohol is being served. This includes water & water bottles, juice, soda, beer, etc. 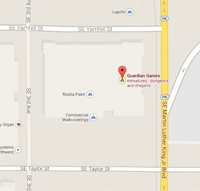 All drinks consumed in these areas must be purchased from Guardian Games. Please visit our online calendar or use our ‘Reservation Form’ to find out availability. Click here for our floor plan!